Washington, DC, May 2, 2016 –Condominium buyers now have an opportunity to acquire spacious, stylish two-level homes in Washington’s dynamic U Street corridor, just three blocks fromthe U Street Metro station. 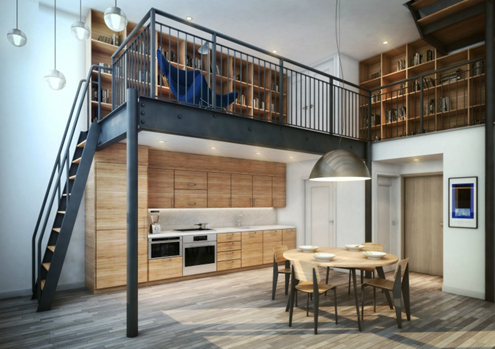 Urban Pace has launched sales of The Lofts at 1111W, with prices starting in the $800,000s. The latest project from The UIP Companies, The Lofts at 1111W offer highly desirable features rarely seen in this neighborhood, including lofts in each of the building’s14 residences, soaring 18-foot ceilings, open floor plans, full-size laundry equipment, gas cooking, fireplaces, multiple USB charging outlets, soaking tubs, and Nest Learning Thermostats. Each condominium home has two bedrooms, a lofted den, and 2.5 bathrooms. Thoughtfully designed by Christopher Boutlier, the modern interior finishes include hardwood floors, Bosch kitchen appliances including concealed refrigerator and dishwasher, Kohler under-mount sinks, Toto dual-flush toilets, chrome hardware, quartz countertops and subway tile kitchen backsplashes. Residents will have use of an outdoor patio with a gas barbeque and lighted landscaping. “With an unparalleled location, new on-trend interiors, and some of the area’s most expansive floor plans, The Lofts at 1111W are sure to sell briskly,” said Matt Dewey of Urban Pace. For sales information, visit www.1111wstreet.com. Urban Pace, a part of the The Long & Foster Companies, provides marketing, sales, and advisory services to real estate developers specializing in condominium and multi-family developments. Founded in 2001, Urban Pace has worked on more than five million square feet of property and over 5,000 units. For more information, please visit www.urbanpace.comor call 202.296.1203. Follow Urban Pace on Facebook, (www.facebook.com/urbanpace) and Twitter (https://twitter.com/urbanpace). The UIP family of companies owns and manages more than 2,500 apartments and condominiums in Washington, DC and Maryland and has renovated, restored and built more than 25 downtown apartment buildings and condominiums over the last ten years. UIP’s primary focus includes “heavy lift” renovations as well as new construction of rental and for-sale product. UIP also is active in entitling land, infill development, and acquiring occupied residential assets in the close-in Washington, DC suburbs. UIP’s three subsidiary companies provide construction, property management, and development services for third-party clients as well. For more information, visit www.uipllc.com, www.uippm.comand www.uipgc.com.